Simon LeBatre is considered one of the best in the business at saving lives over a phone line, but when he gets a call from Danny, he ends up getting more than he bargained for. It seems that Danny not only has taken an overdose of pills and alcohol, but he refuses to tell Simon where he is calling from or even his last name. All Danny will tell is his story, making us flashback to the events leading up to his desperate act of self-destruction. 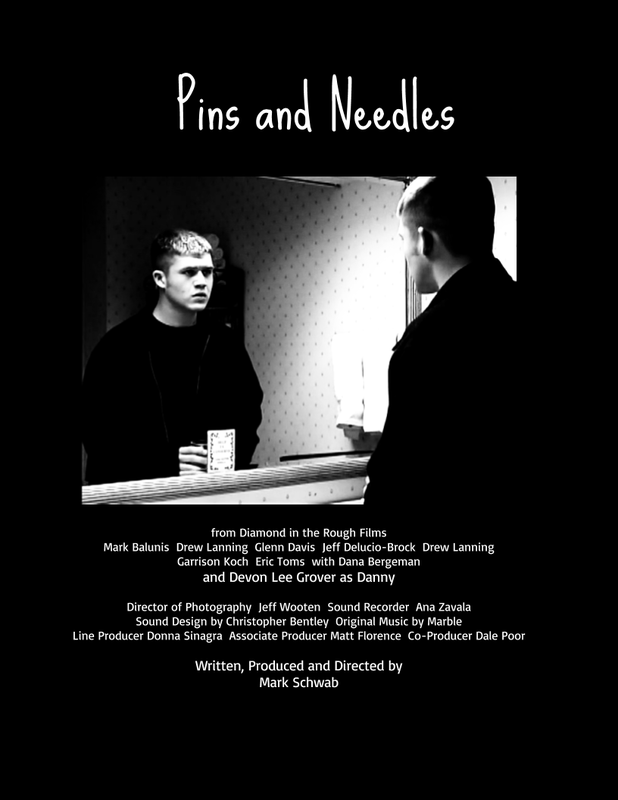 At first I was unaware that "Pins And Needles" was an indie film from 2001. Things were a little different then, and indie films were so much harder to create. I wrestled with the notion that maybe I was being a little harsh with my review, considering the time this film was made. Maybe, just maybe I should be a little more generous with this. Right? I decided against it. The date something is made doesn't matter to the viewer. It really only comes down to two things. They like it or they don't. With that written however, let me just say that Mark Schwab should be patted on the back for completing an indie feature film in 2001, with essentially no money, that is still very watchable. This wasn't the norm back then, and even now days, there's more than a few indie films that make a person want to curl up in a little ball and cry. Essentially, we have a stylish drama that progresses through flashbacks mainly. Nothing truly original yet completely workable. The drama unfolds as a crisis agent attempts to talk down a suicidal man while attempting to get his address. Instead of a flat out reveal, "Danny", the suicidal person of interest, relays his story in a linear fashon from the past, moving closer to the present time. Crisis agent "Simon" must piece together clues in the story, ultimately leading authorities to his location. This sounds like it could be a really interesting film. All the pieces are in place for one hell of a ride. Unfortunately, the film falls a little short with it's delivery. The stylistic choice to use black and white for the present tense, and color for flashbacks, may have felt like a good idea at the time. For me however, this gimmick just felt backwards throughout the entire film. Maybe my brain has been hardwired to think of the past in black and white, as most films do just that. Maybe I've been bastardized towards new ideas, but one simple fact remains... No matter why, I just didn't like it. It felt counter intuitive and confusing. The quality of the film was another let down for me. Now, I realize it all comes back to when this movie was made. But just like when I watch my favorite film from the 80s, I can't help but groan about how cheap it looks. This aspect played a huge part when I thought about doubling back on my review rating, due to the age of the movie. Again, I ended up realizing it didn't matter. I'm watching it now, not then, just like any other new viewer. Save a few awkward dialog issues, such as authorities calling the crisis line: The Local Crisis Hotline, most of the dialog was real and believable. Returning back to the "local" reference, no paramedic or officer would call it the "local hotline." They would simply call it the crisis hotline. Case in point, a paramedic wouldn't pick up a phone and say: "Is this the local crisis hotline." They would simply ask if this was the "Crisis hotline", since they already knew it was local. Another point of concern for me was an element that just didn't feel real. My wife had worked in a similar call center a for a few years, and never... ever would an untrained civillian be allowed in the call center. No matter what. It's a danger to everyone involved because of the emotional impact these calls can have. Maybe this rule is different in other places, but I just couldn't wrap my head around it. What I did like about "Pins And Needles" was the bulk of the acting. Not to say everything was perfect, but the leads, mainly Simon (Mark Balunis) and Danny (Devon Lee grover) did excellent jobs portraying their characters. Their beleivability compounded with some solid performances from the supporting cast really helped this film push forward. Even through the dated technicalities of the production. Although not the picture of perfection, "Pins And Needles" presents enough entertainment to kill some time when you got it. I have no doubt that had I watched this film 15 years ago I would have marvelled at what it had accomplished. Given the quality of indie films of the era. Now days however, it remains an interesting piece of filmmaking history that almost holds up against the hands of time. The solid performances and dramatic subject matter make it something to watch at least once, before moving on to bigger and better things.